At INVESTinNC our mission is to educate small business owners and investors in North Carolina about investment crowdfunding opportunities. A question we like to ask business owners in North Carolina is, "Have you experienced challenges when raising capital for your business?" Almost everyone we ask answers, "Yes". If you are someone that would answer the same way, we would like to provide some helpful information on how accessing capital can be made easier. Before making a choice, be sure to weigh your options and consider the costs and effort each requires. First things first. Ask yourself, is investment crowdfunding right for you? (Are you planning to raise between $250K and $2 million?) If yes, great! Present a compelling business case and offer. Ask yourself is this offer attractive to the investors I'm seeking? Develop an effective marketing plan. To truly be successful in the investment crowdfunding arena, you need to be prepared to market your campaign appropriately. Engage your crowd! Obviously, the main factor contributing to the success of your campaign is your crowd aka your investors! Maintain compliance with NC PACES Act. An experienced team and authorized portal can help keep you in appraised and compliant. Stay on target and efficient when it comes to timelines and deliverables. An important part of a successful raise is to abide by the established timelines and reporting requests. 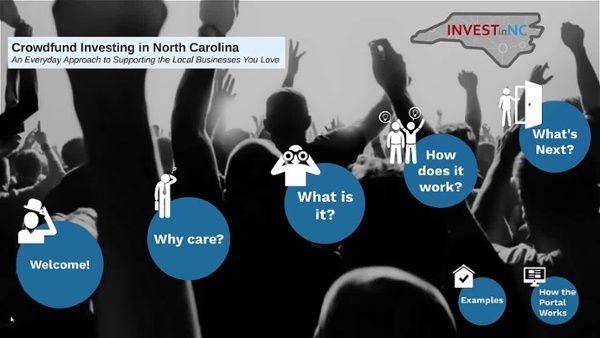 To learn more about INVESTinNC, investment crowdfunding in North Carolina and if this funding option is right for you and your business, let us know. In the meantime check out our overview video presentation provided below.